When you have a problem with an antique lock you can’t just call a locksmith. Our 95 year old door handle has become a little temperamental in the past few years. On different occasions our lock has jammed, the door knob has broken off, and the door wouldn’t open from the outside. I contacted Liz’s Anique Hardware, a Los Angeles institution, about our problem. I spoke with Bryan Wood and learned that he often fixes old hardware and locks in the West Adams area. Bryan has been out to our house several times and has gotten our door handle back up and running. Bryan was just here last night. Hopefully, our door hardware will be good for another year. 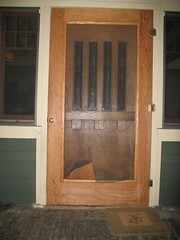 Call Liz’s Anique Hardware 323.939.4403 and ask for Bryan Wood in the antique hardware section.